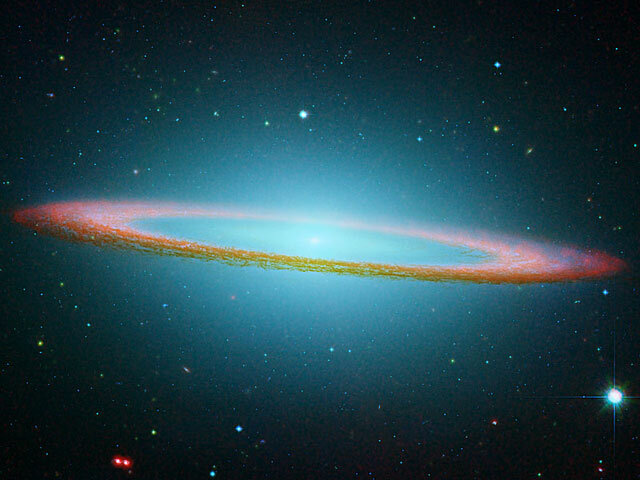 Infrared-light composite filtered image of M104 Galaxy taken by Spitzer Space Telescope in june 2004. Galaxy M104 (”Sombrero galaxy”) is located in the Virgo cluster, at a distance of about 30 million light-years. 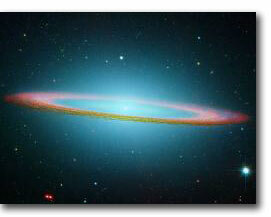 Its giant ring of dust spans over 50000 light years. It is believed that a supermassive black hole of a billion solar masses is located at its center. We can understand the paradoxes by Zeno of Elea (ca. 470 BC)1 in two ways. The first interpretation is that Zeno is not denying movement, but rather questioning its continuity, which is what actually leads to the paradoxes. In this sense, we can consider that Zeno is experiencing a kind of technical difficulty, and that the problem can be easily solved with calculus or as a converging sum of an infinite series. This interpretation is however short-sighted in its way of arbitrarily postulating the existence of movement, and just concentrating on the technical argument of the consistency of continuity, which is truly a mathematical problem and not a physical nor philosophical one. It shall be noted that one cannot prove that Zeno intended to contradict that the sum of an infinite series can be finite, as the mention of ‘finite time’ appearing in the report of the paradoxes2 could be merely an interpretation by Aristotle. The second interpretation is that Zeno basically denies movement, in the extraordinarily modern meaning of Parmenides, who considered change as illusory and the world as static and eternal. Zeno is not denying the appearance of movement, but rather its reality. The paradoxes thus appear at a deeper level, from the comparison between the phenomenon of movement and its disappearance implied by a thorough analysis of its model - either it being continuous (dichotomy paradox) or discontinuous (arrow paradox) -. The question becomes a purely physical question, which must be answered within a physical theory : why the experience of movement if movement appears logically impossible? In the classical continuous model, the arrow must assume an infinite number of states in order to move from a point to another point. If such an infinite separation between two events, modelled by the absence of the successor of a real number, is equivalent or not to their physical dissociation, is a physical question, on the same level of reasoning as the ultraviolet catastrophe ideas which brought to quantum mechanics.3 If infinite divisibility is mathematically consistent, it is not necessarily physically meaningful (see also the Banach-Tarski paradox).4 This picture further changes with quantum mechanics as, per Heisenberg principle, a particle in a determined motion does not have a determined position. Interestingly, Zeno also gives his name to a quantum effect described by the Misra-Sudarshan theorem :5 if it is observed continuously whether a ‘quantum arrow’ has left the space it occupies, then it indeed never leaves this space. • DICHOTOMY: Motion is impossible, because before arriving to the end, that which is moved must first arrive at the middle, and so on ad infinitum. • ACHILLES: The slower tortoise cannot be overtaken by the quicker Achilles, as he must first reach the point where the tortoise started, from which it has already left, and so on ad infinitum. 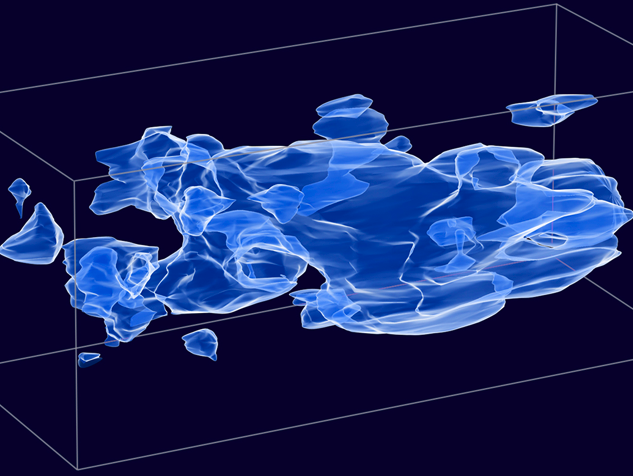 Three-dimensional map of the large-scale distribution of dark matter in the observable universe, from Hubble Space Telescope data (NASA, Jan 7, 2007). The map, determined by analysis of gravitational distortions of light coming from distant galaxies, reveals a network of filaments intersecting at the locations of normal matter in galaxy clusters. Clumping of dark matter appears more pronounced from right (distant regions in space and time) to left (nearest and recent regions). 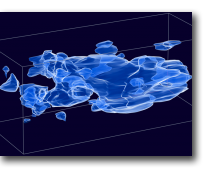 Dark matter is a theoretical form of matter currently observed only by its gravitational effects and representing in the standard cosmological model about 20% of the energy density of the universe. It was first postulated to explain some motions of galaxies and other cosmological data, and confirmed by gravitational lensing observations of the Bullet Cluster of galaxies in August 2006. 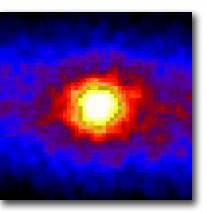 Image of the Sun taken through the Earth, in “neutrino light”, at the Super-Kamiokande detector (Japan). 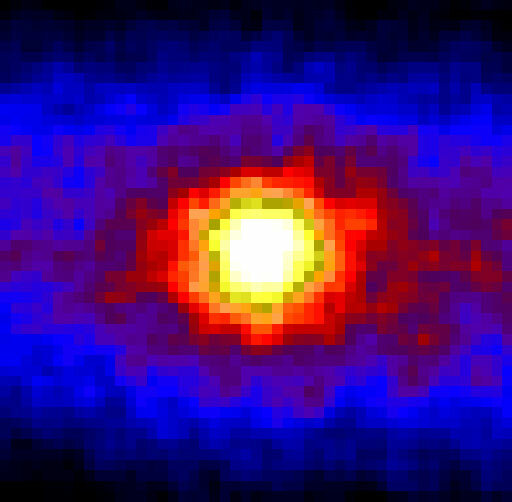 The image has been obtained with a 503 days exposure, by registering neutrinos emitted from the solar core and detected in a 50 000-ton water pool located 1 km underground. 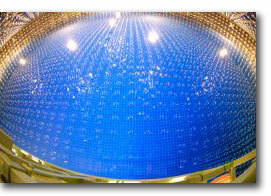 At night, neutrinos were transparently traversing the whole earth before being registered in this image. A neutrino is an elementary matter particle of almost zero mass, only interacting through weak nuclear forces and gravity, leading to its unimpeded traveling through ordinary solid matter at almost the speed of light. 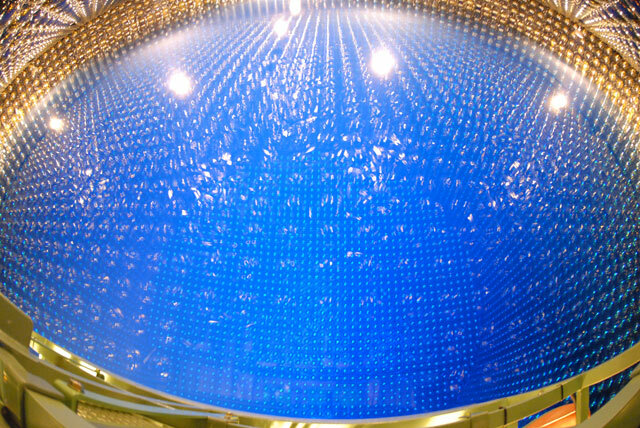 During a rare interaction between a neutrino and an electron in the water, the electron is accelerated at a speed greater than the speed of light in water, producing a pulse of light -called Cherenkov radiation- similar to a supersonic boom. These pulses are detected by thousands of light amplifiers disposed everywhere on the pool surface. Most theories predict that at some time in the future, matter, structures, and/or the universe will have an end. Protons could decay within about 1050 years according to Grand Unification theories.1 The whole universe should approach an absolute zero temperature within 10100 years, even black holes having evaporated.2 And time itself could have an end, in a final imploding big-crunch singularity3 or in a diverging expansion cutting the universe in smaller and smaller chunks up to each particle.4 If a form of intelligent life would still exist by such times (certainly not based on current biology), how could it adapt to handle such fundamental limits? So how to escape the system? Logically this should be impossible. However, the system could prove to be more deep and resourceful than we perceive it today. So this fundamental question appears to be an introductory question about the nature and meaning of time. Finally there are simple ideas of which no definition can be given; there are also axioms or postulates, or in a word primary principles, which cannot be proved and have no need of proof. Copyright 2006-2010 Strange Paths, all rights reserved.